Weddings are wonderful whatever the time of year. It’s true you do have to deal with anxious brides-to-be that change their minds every five minutes and even worse, anxious mothers’ of the brides! But the atmosphere is always electric and it is your chance to shine as a florist because it is the only real occasion where the majority of the skills you’ve learnt come to the fore. Your job is to make everywhere, from the ceremony venue to the reception, and to make everyone from the bride to the bridesmaid, look wonderful. And with an accessory such as a flower, you can only succeed. Designing something for a bridesmaid or attendant to carry is relatively easy once your bride –to-be has chosen her colour scheme, theme and outfits. Just keep in mind that the attendants’ flowers should never outshine those of the bride, the design should be smaller and the colours should complement the dresses of both the bride and the bridesmaids.You often find that the bride’s bouquet is far more subtle and muted than that of her attendants. Her bridesmaids’ arrangements will generally tend to focus on the strongest colour of the wedding. Up until not so long ago the most common design for bridesmaids to carry was small posies of flowers, or a simple country basket. These days anything goes! Floral pomanders are slowly coming back in fashion as are decorated fans and jewelled handbags stuffed full of glorious coloured blooms. Wonderfully coloured ribbons and tulle, feather, beads and decorative wires are de rigueur. While it has even been known to make floral collars for your four legged best friend to follow you up the aisle! But because a wedding is a busy time and you put a lot of effort into making the bride’s bouquet amazing and decorating the venue, it is nice to be able to create something which is stunning, has wonderful visual impact, yet is very quick and easy to make. A wired cornet can be bought cheaply from any floral wholesalers. They come in different sizes, so there’s one to suit every height of bridesmaid; and they are easy to carry and very robust. Ideal for the smaller bridesmaid who may like to swing her arrangement around! Add a few flowers which echo those found in the bride’s bouquet, some decorative wire, silk or even fresh petals and you have a stunning design for your bridesmaid. Perfect flowers for this are: small headed roses, spray carnations, freesias, wax flower and orchids, while soft ruscus or ivy are perfect foliages. 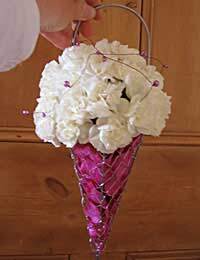 Ten stems of spray carnations which are already open; small wedding bouquet holder; silver cornet (available from any florists’ wholesaler); decorative wire; silk petals). Lay out all your materials. Cut spray carnations to size. Lay several lengths of decorative wire over the carnations securing in the foam by lopping the ends. For added interest you could tie complementary coloured ribbon to the handle.